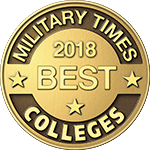 December 19, 2017 – Cypress, CA – Military Times has announced its Military Times Best: Colleges 2018 rankings, and for the third consecutive year Trident University International (Trident) has made the list. Formerly known as Best for Vets, Trident placed at #19 on the Online and Nontraditional Schools list. Now in its eighth year, the Military Times Best: Colleges 2018 rankings factor in the results of Military Times’ annual survey, the most comprehensive school-by-school assessment of veteran and military student services and rates of academic achievement. Military Times’ annual Best Colleges survey asks colleges and universities to meticulously document a tremendous array of services, special rules, accommodations and financial incentives offered to students with military ties; and to describe many aspects of veteran culture on a campus. Military Times also factors in data from the Veterans Affairs and Defense departments, as well as three Education Department sources: the IPEDS Data Center, College Scorecard data and the Cohort Default Rate Database. The rankings are published in a Military Times magazine sent to subscribers, as well as online at MilitaryTimes.com, ArmyTimes.com, NavyTimes.com, AirForceTimes.com, and MarineCorpsTimes.com.